I attended Kutztown University and DuCret School of Art before adopting a Sharpei Bully mix named Cash. Cash helped me to realize my passion for working with animals, so I attended Animal Behavior College and became a Certified Dog Trainer. I still work with Cash at home, teaching him advanced and off-leash training. Learn more about Chris on our dog training page. Did you Know: I began my dog-training career when I was 8-years-old, training my family dog. Hi my name is Christine. I’ve been working at Bryn Mawr Veterinary Hospital since 2008. I’ve always enjoyed working with animals. I have learned a lot since I have been here and want to continue my knowledge in the animal world. I got married on November 11th 2011. My hobbies outside of work are taking care of my daughter and watching the Flyers! I currently have two cats; Molly and Abby. Did you Know: I am a vegetarian. Hi. My name is Lauren. 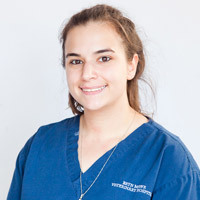 I just started working at Bryn Mawr Veterinary Hospital and I love it! I have learned so much that helps me with my Veterinary Technician Classes that I am currently taking. I have two dogs and a cat. Did you know: I love doing advanced training with my one year old Doberman. Hey, I’m Maggie. I have been working at BMVH for over a year now. I am going to be heading to Hampshire College in a couple weeks to study Animal Behavior. I have three dogs at home and have spent three summers helping raise litters of puppies for a kennel in Allentown. I love taking care of all of your pets here at BMVH and will be coming back on breaks from school!